Nine Years Ago Today… What a Journey! Nine years ago today, I wrote my first article here on Needle ‘n Thread. … No. Actually, I never thought it was attractive at all. There wasn’t a lot to choose from back then, when it came to free blogging templates. Yes, that is orange and grey. Throw in a bit of split-pea-soup green, and you’ll have the whole picture. When I started Needle ‘n Thread, it was just “by accident.” I’m sure I’ve told you the story before, but for those who are new, here’s the short version. And that’s where Needle ‘n Thread started. The tools were pretty basic: a free Blogger template, an old point-and-shoot 2 megapixel camera, an IBM laptop that weighed about 15 pounds, and a dial-up connection. I didn’t know what to expect with Needle ‘n Thread. My plan was just to extend my summer class instructions so that they could be accessed away from the classroom and beyond summer break, and maybe reach a wider online audience that might be interested in learning embroidery. It was really fun to watch the website grow and the audience extend! After a year, though, I was really sick of the look of the site. And so, in 2007, the next phase: tweaking an almost-free template to try to improve the looks of Needle ‘n Thread. For the next several years, I balanced my teaching career with Needle ‘n Thread as a side hobby. But as the site grew, so did the amount of time it took to keep it up. During the academic year, I’d put about 20 hours a week into the website, which became a bit burdensome. During summers and holidays, working in 20 hours wasn’t so hard, but wow. It was a bit draining when I was also teaching full time. So, for a while, I let the website coast a bit, going pretty light on blogging. Still, the website grew. And more and more people asked questions, left comments, got involved in the subjects we were chatting about. Finally, in 2010, with the ever-increasing sleekness of internet technology, it became evident that the site needed a face-lift and a new structure to build on. Actually, two things became evident: 1. The site needed some serious work; and 2. It was either one or the other – teaching or Needle ‘n Thread. They were both full time jobs. Considering the possibility of going forward with Needle ‘n Thread full time in the future, and since I still had a regular salary and benefits and an income, I decided to go ahead with a whole site re-design. I contacted a professional design company, Imagemakers, Inc., in Wamego, KS, and they set about designing a better Needle ‘n Thread, with WordPress as the foundation. Meanwhile, I pondered the great question: Do I leap, or don’t I? After the site re-design, an interesting thing happened. Needle ‘n Thread tripled in traffic volume and subscriber numbers in a period of about six months. By then, I had also realized that I was happier embroidering and writing on my website, interacting with so many people over the subject of needlework, and I felt as if Needle ‘n Thread made a real difference in the lives of many people. How could I just drop it? In 2011, I didn’t renew my teaching contracts for the next year. I’m approaching the fourth year of Needle ‘n Thread full-time, and I think it was a good choice. Perhaps it’s not been the most stable situation, as far as income and security are concerned, but it’s been ok. I love what I do, and it is truly a blessing to be able to do it. What’s next for Needle ‘n Thread and me? Well, you know that ever-changing Internet out there? It’s ever changing! Right now, Needle ‘n Thread is in need of some serious work on the website, so later this year, you’ll see a site re-design (though it’ll still be recognizable as Needle ‘n Thread), with a much more user-friendly mobile interface. There’s also a new book in the future – as in, commissioned by a publisher. So that’s exciting! Other plans include a new online classroom set-up so that I can offer you a few online classes now and then. And finally, there’s the content, the projects, the tutorials, the discussions, the fun of chatting up embroidery with you! Because really, Needle ‘n Thread isn’t about me. It’s about you. I wouldn’t be doing this at all, if it weren’t for you. It wouldn’t be fun, if it weren’t for you. You make Needle ‘n Thread what it is – a dynamic community of embroidery enthusiasts who inspire, create, stitch, discuss, and learn together. Thanks for sticking with me through nine years of embroidery bliss! Many congratulations Mary, you’ve changed the world for stitchers everywhere! This is my first look every day – – if I want information on stitches, tools, projects, styles, books, stitch problem solving, colours, threads – – and I could go on and on – Needle ‘n Thread is my first stop. It’s the most wonderful resource! I love to follow your projects – – and actually enjoy most when you aren’t happy with some aspect, so you do it again and we all get to learn how to look for “non-perfect-technique” and then how to fix it – fantastic teaching!!! I love it when you have a new thread/stitching tool to test out – and almost best of all I love reading your book reviews!!!! So Mary, congratulations on the anniversary and thank you for the work you do to provide us with a really classy resource. Now, on to the next 9 years! Nine years ago wow that has gone quick, I found your site the beginning of 2011 and I have never looked back, I for one am glad you choose to leap with Needle ‘n Thread as opposed to teaching as I have learnt so much and enjoyed every minute of your website. I think you are a dynamic teacher who gives so much of her time and energy into all aspects of embroidery and shares so much, without which I think I would have given up on embroidery if it wasn’t for your enthusiasm and knowledge and expertise on all aspects of needlework and beyond. I’m Really looking forward to the new site and for the new publication of a book and on-line classroom and the new content page of projects, tutorials and discussion this all sounds very new and exciting. Thank you for sharing with us your future new website. Nine years? Congratulations! I discovered you and Needle’n’Thread long after that, but your post are now a fixture in my day. Funny how we fall into these things. My own blog (which is very small and humble in comparison), started because Shrewsbury, where I live, was having a celebration for Charles Darwin’s centenary in 2009, and wanted some people to learn to use a blog and report the events. It was a while before I started to concentrate mainly on embroidery on the blog, but I’ve loved being able to share some of my knowledge and discoveries, and I’ve made some very good friends in the process. Needle’n’Thread is the best embroidery techniques resource on the web, bar none. I’m very glad you decided to trust your instinct and keep on with it, Mary. Here’s to the next nine years – or maybe more if we’re lucky! I’m new. I only subscribed a few weeks ago to your newsletter. I LOVE your site. I found you when looking for hand embroidery stitches. I’m mainly a cross stitcher and quilter and wanted to expand my hand embroidery skills to do a crazy quilt project. You provide so very much information that I feel as though I’ve only skimmed the surface of what you have to offer. I’ve been going back and reading through your archives and I’m just blown away by how much you offer. The articles on needles, the way you show us the whole process that you go thru, from beginning to end, for the projects, the review of books and tools, the stitch fun articles, etc, etc…. Just so much. Thanks so much for being here!!! Thanks for taking the leap, Mary. Your site is very helpful! Congratulations! I haven’t been with you from the beginning, but the past couple or so years have been very educational and enlightening. I enjoy your writing, which is so well done compared to some other bloggers. Must be your teaching background. =) Thanks for the great lessons! I’ve only been visiting for a very short while and I’m glad I’ve met you. I love your teaching style, your work is so beautiful, and I especially enjoy your humor, which causes me to chuckle out loud. ‘A merry heart doeth good like a medicine.’ Thanks for all you do. It’s obvious what all you pour into teaching and sharing. Blessings friend! Reading your blog has become one of my daily pleasures, and you continue to be such a source of inspiration for me! I am constantly challenged to attempt new embroidery techniques; you provide so many resources, not to mention patterns and tutorials. I look forward to many more years of Needle ‘n Thread, and I thank you for your dedication and enthusiasm. Congratulations, Mary; nine years is an impressive success. I remember the excitement I felt when reading your blog. It was what so many of us were looking for: a connection and instruction. You gave us your valuable time and knowledge, and that is no small matter under any circumstance. Thank you for starting Needle ‘n Thread, and thanks for carrying on with it. Wishing you much success as you move forward. Congratulations, Mary, and thank you and God bless you. You are amazing. I am so glad it has been such a rewarding experience for you, and that running the site has provided you with enough income to do it full time. Thank you for all you have shared with us through the years, and here’s hoping for many more years, and greater success with each passing of the earth around the sun. This text (in Brazilian Portuguese) will be publish tomorrow in my Facebook page (https://www.facebook.com/Oficio.da.Agulha). But, today I want to congratulate you for all these years – well done! Happy anniversary! Love getting the newsletter and for helping me enhance my stash! May I add my congratulations to you on your ninth blog-versary? 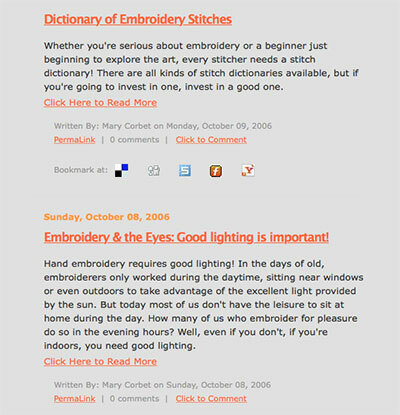 Over at the CrossStitchForum which I help to moderate, your site is the one we recommend for learning new stitches, of course, but also where our newbies (and not so newbies) can learn more about types of threads, needles, fabric, transferring designs, how to bind hoops… I discovered your site when I was planning an embroidery which was part of a history exhibition and I needed help with plaited braid stitch. Well, imagine my delight! I look forward to the new face of Needle ‘n’ Thread. Congratulations, Mary! I love your website and look forward to reading it every day. I am a new subscriber and look for your messages daily. If you don’t write on any particular day, I go back into the archive and happily read articles from the past. I have learned so much! I am not new to stitching or embroidery. I have been a member of EGA for almost 25 years and have been a quilter (traditional, modern, and crazy quilter) almost as long. I have a number of unfinished projects to tackle and now, a list of new ones to be started! Oh, there is so much to learn. I am afraid that you have inspired me to spend some money and I have purchased several books, new threads, ground fabrics, and most recently, some frames. Anyway, thank you for your leap of faith and for your wonderful website. And thank you for helping to create a community of enthusiastic stitchers. (I learn so much from the comments.) I look forward to your new site, your book, and your online classroom. And the next nine years plus. Another great post, apart from the last paragraph — I know a blog needs readers to thrive, but first and foremost it needs an author, and in this particular case, it needs you. It is your choice of subjects, your style of writing, your knowledge & expertise and your generosity in sharing it, your ability to share it (not everyone who can do something really well can also teach it to others — we’ve probably all suffered from teachers who just couldn’t make us see or understand) that make this blog what it is. Thank you for a lot of inspiration over the years, and here’s to many more! On-line classes! Yes! Here’s to another nine years! Thank you Mary for going with what you love. It shows! I love your humor and the way you write – it’s just like being there with you. Keep writing and teaching and we’ll be right there reading and learning! oh, Mary! congratulations on this anniversary, the ninth! your Alphabet is my carrot for when I’ll finally leap myself, into embroidery! I’ve been dreaming about doing it for years while reading and watching you, knowing there’ll be classes is FANTASTIC! I can’t wait!! Needle’n Thread is my best embroidery techniques resource. Thank you for nine wonderful years; you are such a gift to all of your followers. I’m so appreciative of the work you’ve put into this venture. I’ve learned more than I ever dreamed of learning about embroidery, and I hope to move beyond novice stage one day. Thank you! In my opinion WE are blessed by YOU! Every one of your blog pieces gives us new information or reminds us of information we had forgotten about. You have also brought us together and we can learn from each other. You ARE still teaching, except that you can not see our faces on a daily basis. At times it can be that life gets in the way of our stitching, but the act of reading your message in our inboxes gives us a few minutes of escape from whatever situations we are currently dealing with at the moment. At the same time you have taught us that others are working on multiple projects at one time too. Thank you so much for your time and the effort that you put into nearly each of the calendar days. You are a bright spot in our lives, reminding us that we have the ability in our stitching to escape the real world for even a few minutes each day. How exciting to read about your plans for the future of the website. Keep it up, it’s always interesting and I can’t wait to see it all. Thank you for taking the time to explain to us out here in ‘internetland’. I think it goes without saying that all of us appreciate you taking that leap! I tell everyone I know or meet who are interested in learning or improving their needlework that yours is, hands-down, the best site. Needle’n’Thread is also one of the very best sites, period, for online instruction, and I firmly believe that most (yes, MOST) other instructional sites and blogs, no matter the subject they cover, could learn from your video, photo, and text tutorials. Your attention to detail, conversational tone, and understanding of how to show and explain (along with your understanding of how people best learn), makes for clearly understood instruction. It also helps that your own work is gorgeously gorgeous and inspirational in and of itself. I would gush some more, but long comments send me into zone-out mode, and I don’t want to lull anyone else into a nap, so I will end with this: Without further gilding the lily, you’re the best, Mary, truly, and appreciated more than any of us could ever adequately convey. Perfectly expressed and my sentiments exactly! Congratulations and thank you Mary for your blog, each day , it is a pleasure to read it.Thanks also for your wonderful videos, I learn so much with you during these last years. Mary, I think it should be us thanking you! The information you provide is invaluable. From your detailed and easy-to-understand instructions on specific stitches to your tool and book reviews, discussions about different types of embroidery, or listing of resources on where we can purchase things — everything you provide is so helpful and interesting. I cannot tell you how many times I have run to your site to look up something or see what tool you might recommend. Without you and your wonderful blog, stitchers like me would have to work much harder to learn and, therefore, less time actually stitching. So, thank you for taking that leap, for all of your hard work, and for sharing your knowledge with us! We really do appreciate it! Congratulations, Mary, on your Anniversary! And, thank you, for taking that Leap! One leap leads to another, as they say, and for me, that has been a leap of embroidery joy. Your blog has introduced me to a world of fine needlework I didn’t know existed, encouraged me in my own needlework attempts, and provided a comforting, friendly visit I look forward to daily. Thank you! I wish you joy and a bountiful next 9! It was a happy, fortuitous day I stumbled across your blog!You are without a doubt, one of my favorite blogs to visit. I tell anyone who wants to know about learning how to embroider to come visit your blog. Thank you for sharing so much of your passion, interest, knowledge and joy! You’ve changed our lives, and added so much! Mary, I always look forward to the post from you. This siting always requires a beverage and a good long sitdown. Thank you so much for your efforts. A few years ago a friend told me that needlework was a dying art and I should spend more time at my sewing machine or painting furniture! I laughed at her and gave her the name of your blog. When I get bogged down or just want a refresher, I know exactly where to go. Thank you for sharing your talent and passion with us. Thank you so much for sticking with it. I have been a subscriber for only about a year, and I always read every word of your blogs. I am new to embroidery, you see, and your website is one of the few who carry everything I needed to get started–and so much more. They say, “Do what you love, and you will never work a day in your life!” Congrats on 9 years. I am looking forward to the next nine!! I can’t tell you how much your teachings have helped me learn and grow. I’m having such a great time trying new kinds of embroidery and working on getting better. I’m self taught and websites are my classroom. Thank you for all the work and fun. Congratulations for nine years of such wonderful work! and, of course, my BIG BIG Thank You, dear Mary Corbet! tell just what I felt when I found your blog eight years ago. Since then I’m following you! Mary, you have furthered the art of embroidery more than anyone else in the world. You have inspired, taught and encouraged others to blog. So often I hear–“Have you checked what Mary says about such and such” or ” The answer to your question is on Needle and Thread”. You’ve opened a whole new world to many of us. Thank you!!!!!!!!! WWMD? No, not weapons of mass destruction! but What Would Mary Do? You are my go-to gal for everything needlework! Your opinion of a Millenium frame or a System 4? Check with Mary! Where should I purchase them? Check with Mary! How should I attach beads to the ground fabric? Check with Mary! Thank you for your knowledge and willingness to always answer questions from a novice like me. The teaching profession didn’t lose an expert when you made the leap–you just moved to another venue. Congratulations and best wishes for many more nines to come! Msry, you’ve been a Godsend! I’m with you every single day. Much success on your new book. I’ll buy it no matter what it’s about. This is what you get when you have a twinkle in your eye! Congratulations Mary! THANK YOU, MARY. A thousand times. For this place, all through the years. I look forward to seeing your plans for the redesign become real, but honestly, if you didn’t change a darn thing, this would still be THE best embroidery source on the internet. By miles. Congrats! You didn’t say what subject you taught. But from the way you write and instruct on this blog I believe you are the kind of teacher that students would want to take the class not because of the subject because of the teacher knowing that they would be learning but also enjoying it. There are so many people ‘out here’ who have benefited from your kindness and dedication, Mary. Your encouragement has meant a great deal to me so I could try out new ideas and techniques I would never have thought of. A very big thank you and ‘onwards and upwards’ for the future! Nine years? Wonderful Mary. I haven’t been around for all nine but a while before you made the leap. I remember that once I found you it took me MONTHS reading through all your archives. I took look forward to getting the newsletter every day in my inbox. I’ve read all the comments today and haven’t seen the answer to my question. and that is….drum roll….how many of us are there? So tell us Mary. I know we are legion but just how big is the legion. I know you probably can’t tell the exact number of people who drop by but how many get the newsletter every day? but most of all THANK YOU! I found you when I was in a real dark place and your site brought a lot of light into my life for which I will be forever grateful. may you and your site live long and prosper…lol. Brava. I’m glad you had the courage to leap. I love your website and your cheerful chatter. You’ve brought the whole world lots of useful information, with a smile. Congratulations! Wishing you many more happy years of teaching and sharing embroidery and needlework. Congratulations! Well done! And Thank you so much! Like so many, I’ve learned a lot from your site. You’re a great teacher, and your website is organized in a way it’s easy to find everything. In fact I’ve shown your website to more than one person who was looking to build their own website — on a totally different topic (teacher education). Let us know when we can put in for an advance order for your book! And I look forward to your online classes! Thank you for the past nine years, the next nine will be even more exciting. You’re a special person, Mary. Congratulations on your Nine Year Blog Anniversary! And a big thank-you to your brother, also! Just think: when I was three years old and had never even touched a needle before, you were just embarking on a journey that would change the embroidery world. I know that so many people (myself included) have greatly increased in knowledge because of the almost-never-ending wealth of information stored away in this wonderful corner of the internet! I’m so excited for the future Needle & Thread – a site re-design? A book? Online classes? I can imagine that teaching and doing a blog at the same time was overwhelming. Your way of blogging, with all the photos, is very instructive and, I amagine, very intense. It’s also very good for your readers. I’ve often gone to your website to see exactly how a stitch is done when I can’t figure it out from the illustrations at which I’m looking. No, I wasn’t an English teacher; I was a high school librarian. I still can’t end a sentence with a preposition. What did you teach and at what level? Looking forward to the next step on the adventure; with you and all of your other followers. ‘The road goes ever on’ to quote Mr Baggins – but never alone with friends and companions. Thank you for sharing your skills and insights with us over the years. Mary, I can’t say that I have been along for the whole ride but I have been here for a good portion of it. I am a quilter and quilt pattern designer. Your blog gives me something to look at that I wish I did better and provides a bit of a departure from my daily work on things quilt related. It is one of my daily retreats. Thank you. There isn’t anything I can express differently than the other brilliant comments already posted. I’d just like to add my voice and extend my congratulations to the Needle n Thread, endeavor. It’s the first thing I read everyday! So much good information and all without a fee. Thank you Mary, for your generosity! Can’t wait to buy your book! I for one have learned so much from you and all of your fabulous tutorials and links to other sites. I have especially loved watching your step by step projects come to such beautiful finished works of art. Thank you for sharing everything that you do and may the next “?” number of years bring you and all of your readers joy, happiness and more knowledge! When I found your blog three years ago, I went back into the archives to the very beginning and read every single post. Once I was up to date, I began stitching and continuing to read your posts. My world of stitching opened hugely. I frequently access those archives as a resource. Now my greatest fear is that something will take your ever enlightening and inspiring blog away from us. I treasure learning from you every single day! Thank you for sharing and giving so much of yourself. Thank you, thank you. Happy anniversary! Il n’y a que quelques jours que j’ai découvert votre blog, mais le peu que j’ai vu, me fait penser que je suis tombée sur la perle que je cherchais: tout sur toute la broderie. Toutes mes félicitations pour votre travail et très longue vie à votre blog. Il est tellement important de se sentir bien dans ce que l’on fait, vous avez fait le bon choix. Le seul bémol est que je suis française et que les traductions laissent à désirer… Merci pour tout et bonne soirée. Hi Mary, I started following your blog when you were still teaching. I marvelled at how you juggled the two. I’m finishing my second year as a middle school Spanish teacher and was truly amazed because I didn’t realized you had left teaching. I have so much admiration for you and the courage it took for you to make that leap. Congratulations on nine years and thank you for all that you do for us! Excellent site, Mary. A great resource for so many stitchers. Look forward to your new endeavours. I have friends who, lacking computers, go to the local library to indulge in their daily vitamin of the spirit —-Needle”n” Thread—-! We thank you for such a rich … and searchable …. website. May you continue to flourish as our friend and mentor. Congratlations Mary. Thankyou for all the great embroidery instruction you add to help us along our embroidery journey. Happy Birthday to Needle ‘n Thread! What a great evolution … thanks for your vision and tenacity. Yours is a great story of embracing technology and the entrepreneurial spirit. Here’s to another 9 years (and more). I wonder what technology will be like then! Congratulations on your accomplishments and bravery in taking the leap! Happy Anniversary. I recently stumbled across your site and have fallen in love with all the information and lovely words you use to describe what I have loved all my life. I’m now about to teach my grand daughters and have setup everything ready to go on their birthdays and first we will watch your video about each new stitch and then stitch it onto a sampler. And so a new group of potential followers for you appear. Happy anniversary! Your site is my go to for anything embroidery related! Thank you for sharing your gift with all of us. Dearest Mary, congratulations on your ninth anniversary! I look forward to your posts each day. Like so many others have said if I want to know about stitches, threads, fabric, tools & equipment my first place to check is Mary. A friend across the internet space! I love that you connect with the embroidery world and brings us together. I personally would feel quite isolated without Needle’nThread. Thank you and best wishes for your new ventures. Linda estória! Pouco tempo aqui e você é encantadora e talentosa demais. Não vejo a hora das aulas online! Por favor, não esqueça dos que estão longe e de mim que estou aqui no Brasil mas quero participar das aulas. Preciso pagar com cartão visa e ter acesso. Não sou hábil para entender como comprar e pagar. I love this blog. It is my treat, during my morning cup of coffee, to click in and see what Mary has to share today. And your sometimes Saturday postings are like getting a gift-wrapped present when it isn’t even my birthday. Thank you, Mary and God bless you! Congratulations, Mary! You give so much joy and pleasure to so many around the world Thank you so much! Imagine all the people sitting down with coffee after breakfast, enjoying your information, ideas and inspiration, all expressed in such a delightful way. We all feel as though we’re friends because of your sense of humour and your relaxed expression. You always put a smile on my face. Thanks so much for sharing this wonderful story about the development of your site and for creating this wonderful resource and community of embroiderers. I’m so glad I found it! Thank you Mary for coming into my life! I love your newsletter. I have learned so much, because of you. I can not wait for your Blog everyday! Oh,Bug 🙁 Everyone has already said all that could be said. Well Mary, you could walk right by me on the street and not know me, but I feel like I know you at least a little bit. It’s a gift to be able to show how to do things clearly, and you’ve got that gift. Thanks for making the decision to teach us instead of at school. Congratulations Mary!! An amazing journey which I’m so glad you ventured out on. You’ve made such a difference in my life of embroidery! So many wonderful projects, hints, tips, tutorials, etc. You are such a breath of fresh air each morning with your enthusiasm, love of what you do and your generosity in sharing your expertise with us. Congratulations on nine years of Needle n’ Thread. I hope there are many, many more! I love your site. Like chatting to a very good friend. You have inspired me in many ways not just in embroidery. I look forward to your on-line classes and …… a proper published book! Your work is truly exceptional. Thank you for everything that you do. Daily, yours is one of two blogs I look at and I add my congratulations and appreciation that this is what you chose to offer we embroiderers. If we can urge techniques covered in your book to be published, having all the visuals & tips on shishas would get my purchase. Yet there has not been a single page you have shown us without inspiration and excellence, like the differences between Floche and A Broder. Continued success! Thank you, Mary, for 9 wonderful years. I’m not one of the lucky ones who has been with you from the start, but your archives are a goldmine! A wee request for your redesign for mobile devices – remind your designer that some of us still use desktops and expect they will continue to do so for many years to come. I think I must have started following you almost at the beginning, because I remember that header. Congratulations on nine years Mary – and also on the book-to-come (it’s on my wish list already!! )….it will leap frog right over all the other ones that you’ve convinced me that I have to have once it’s available. Can’t wait! I am a member since November 2008 and as a previous reader said, Your mail is the first thing I read when i switch on my computer! My knowledge of Embroidery Stitches, Equipment, Tools, Books etc etc.. all increased because of you Mary. Thanks a lot for all what you do for us! Thank you Mary for your invaluable help and input throught the years. There have been times when I dont know what I’ve had done without you. Congratulations on the 9 years! I found you sometime after the 2007 redesign. I admire those who keep writing year after year, especially when they also have a full-time job. I tried a blog, but it lapsed as I didn’t have enough progress on projects to write about, and the time/energy to write on top of all else. And a book in the works for a publisher? Awesome, it’s about time! I was wondering when that might happen and why you hadn’t had one before, other than time or lack of. Is there any chance that you might take up giving in-person needlework classes or seminars? Instead of thinking the orange/gray/green was not attractive, consider yourself a trail blazer – those colors are quite popular combined in quilts now. A bit belated, but still heartfelt. A big congratulations Mary. What a brave lady, and it has paid off. I hope your success grows and grows until you are no longer “ok” but “beyond the moon” successful. You are a teacher extraordinaire and as you can see, very loved and appreciated. I wonder just how many email “boxes” are opened each day with the first look being “where’s Mary?” I don’t always have time to say hello, but I do always make the time, even if it has to be squeezed in before the supper dishes to read your blog. It is always a bright spot in my day. For me, the learning is wonderful, but even more important it is inspirational. It keeps me at it. Thank you so much for all you do. One question: what happened to those early blogs? Are they incorporated here somewhere or are they just “out there in internetland space”? I would love to see your early effortss for fun, and also, with the upgrade, how will it affect what you have here? I’m assuming it will incorporate all your stitch tutes, etc. But I love to go back and meander thru your old posts at times when I am looking for something specific. God Bless your future, and good luck with that book!!! Check out the archives to the right side of the page. Thanks Liz N. I never realized how far back it went and actually never saw that! Too much other to attract my attention. LOL. Lots of reading over time to do as I would like to read those early posts. Can’t even count how many times I’ve come here looking for one particular thing, ended up reading old posts, and the next thing you know, the morning is gone! I should set a timer…but Mary has created SO MUCH excellent content that you can’t help but get lost in it! Hi Mary Hearty Congratulations! what a journey ! I agree with Loraine, Devon, Judy, Terry Lorra and alll the others!!! Everything that needs to be said has already been said and I have to visit your blog everyday even if i don’t comment ! All the best !love you! Kudos Mary! Thanks for all of your helpful information and reviews. I feel very happy whenever i see your mail, i read fully and then go for the next work… You are my inspiration.. BUT, at this time i wish to Thank your Brother. Because if he was not there at the right time to guide you, WE would not have got you. THANK YOU BROTHER. I do not know anythig about your blog when subcribed for your Newsletter. I just subcribed to it because it is about embroidery. Thats it.But, in few days after subscription, i got your Embroidery on Egg newsletter, which made me crazy on you. When i saw it, i just thought Can embroidery be done even on eggs??? I also thought u made some tricks in it.. HA HA HA.. But in the following newsletters i saw how you did the embroidery. So much of minute works like drilling the eggs.. WoW.. Hats off to you!! And later, started to watch all your projects without fail and started to try them. All you Videos, Tutirols are very easy to understand. Keep going Mary and THANK SO SO SO SO MUCH. Wow, what a fantastic story. I had heard some of it from you before but not all the details of your first blog. I am only sorry I didn’t know about you and your blog back then. The changes sound great. Classes, right on. A book, wonderful, I love real books that I can hold and read or just flip through without all the palaver of getting out a laptop etc. But the thing that makes Needle’n’thread so wonderful isn’t the blog per se, or the gimmicks or the colours – it is YOU and that is why I and thousands more keep coming back. Thank you, Mary. Congratulations! I love your website, it’s my first read every morning. I learned most of what I know about embroidery by reading and watching your videos. Sure there are plenty of sources around, but none so clear and concise as you. I did a little cross stitch that I learned as a child, but here I learned new stitches, new techniques and had a blast. I don’t do ecclesiastical embroidery or use silk and gold threads. In my humble cotton and colors world the fun comes from creating patterns that are fun and ironic and enjoying my work through them. Thanks for all your effort, I hope you have fun with this for many more years. I am soooo glad I found Needle n Thread way back when! I thank you for your knowledge, your dedication, and your insightful and engaging writing!!! You are so encouraging too. Thank you. Congratulations and Thank you! I look forward to your post everyday. Congratulations and many, many thanks for such a wonderful resource for needlework. Your knowledge has amazing breadth and depth and we all appreciate what you share with us. I hope you have many more years of sharing your love of this art form. Great minds, Mary! You share an anniversary with the 800 anniversary of the signing of the Magna Carta!! I love this site, and I share each of your Facebook postings to try to help spread the word…. Congrats on 9 years – and here’s to the next 800!!! Congratulations on the 9 years! Thank You for taking that leap. May you find this adventure a continuing joy. Congratulations and thanks for your wonderful web-site. I encountered it in June 2011 and have followed it ever since with some unavoidable breaks. I’ve gone back to the beginning and caught up to 2011. I’m now filling in the gaps – computer crashes have wiped out my detailed bookmarks a couple of times so I had to go back to 2012 and work forward to the start of 2015 – so now there’s reading forward for this year and reading forward from the past. I’m up to March 2014 now. I am much more meticulous now about regularly saving my bookmarks. There is an incredible amount of useful and encouraging information here; my bookmark record is enormous. So thanks for a very enjoyable time – looking forward to many more.